On behalf of the more than 241,000 law enforcement officers represented by our Association across the country, I write to you to condemn in the strongest possible terms your selection of Colin Kaepernick for Nike’s “Just Do It” ad campaign. Mr. Kaepernick is known, not as a successful athlete, but as a shallow dilletante seeking to gain notoriety by disrespecting the flag for which so many Americans have fought and died. Your inclusion of Mr. Kaepernick in your ads seems appropriate to us. We live in a country where the 1St Amendment is a right of the people. Mr. Kaepernick chose to exercise his right where his passion was on the football field. NAPO believes that Mr. Kaepernick’s choice to openly protest issues surrounding police brutality, racism and social injustices in this country makes him anti-police. On the contrary, the NBPA believes that Mr. Kaepernick’s stance is in direct alignment with what law enforcement stands for-the protection of a people, their human rights, their dignity, their safety, and their rights as American citizens. NAPO has shown an adeptness at maintaining the police status quo and the tone in their letter further validates Mr. Kaepernick’s concerns, as it undermines the trust that is needed by law enforcement in order for the profession to maintain its legitimacy. That NAPO has chosen this matter to take a stance, only perpetuates the narrative that police are racist, with no regard, acknowledgement, respect, or understanding of the issues and concerns of the African- American community. Your quote “Believe in something. Even if it means sacrificing everything.” is also appropriate as it relates to Mr. Kaepernick. For NAPO to presuppose that Mr. Kaepernick has not made sacrifices because he did not die on a battlefield, shows you just how out of touch NAPO is with the African-American community. We would like for them to stop their false narrative that you are not worthy of respect unless you were in the military or worked in law enforcement. The beauty of this country are the countless sacrifices that all people make in their everyday lives. The African?American community makes a sacrifice each time a life is unjustly lost at the hands of the very people who should protect them. A sacrifice is made each time the criminal justice system treats people of color as less than. A sacrifice is made each time a letter is sent asking officers to boycott a corporation, without asking those very African-American officers who are most affected, what their opinion is. If they had asked the NBPA, we would have told them that they are out of line, and that the NBPA supports any person or group who exercises their right to peacefully protest against any form of social injustice, including police brutality and racism. 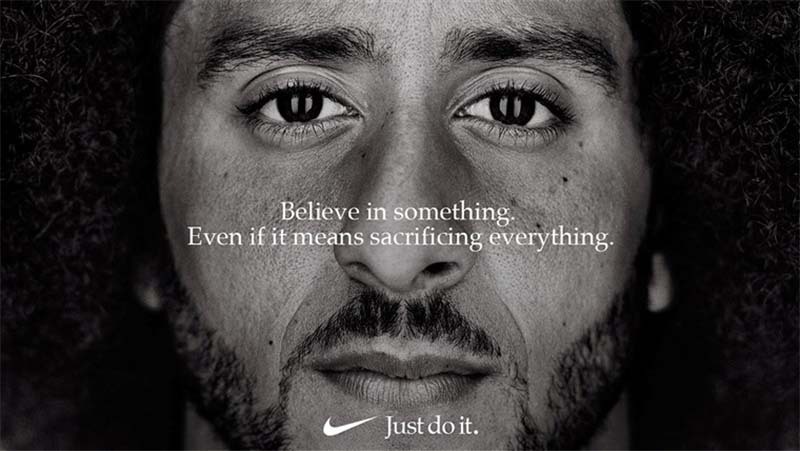 The NBPA proudly supports Nike and your use of Mr. Kaepernick in your new “Just Do It” advertising campaign. Truth and upholding the Constitutional rights of citizens, are cornerstones of leadership in policing. Our mission includes striving constantly to bridge the gap between law enforcement and our communities we are committed to ensuring equity for the community, as we work to enhance trust, legitimacy, transparency, and accountability in policing. We will likely be buying and wearing lots of Nike products in the near future. NOTE: I think Michael McHale’s letter is spot on while Sonia Pruitt’s letter only serves to divide the police along racial lines. Her statement “The African?American community makes a sacrifice each time a life is unjustly lost at the hands of the very people who should protect them” is ridiculous and implies that unjustified police shootings of black men are common. And comparing the sacrifices she mentioned to the sacrifices made by our troops who gave their lives or were gravely wounded while fighting in defense of our country and the freedoms enjoyed by Kaepernick is not only ridiculous, it’s simply outrageous. Yes, white cops do shoot black men. And yes, some of those shootings were not justified. But considering there are 800,000 law enforcement officers in the U.S., shootings of black men by the police are a rare occurrence. The problem is that when it does happen, it is always blown up by the media which would have us believe that white cops go around shooting black men all the time. We know there is a racial divide in this country. And sad to say, now we also know there is a racial divide within the police service. My question is, if black cops subscribe to Pruitt’s crap, how can white cops ever trust a fellow black officer? Divide and conquer, works every time.